The Xuedou Temple in Fenghua County will starting building the new Giant Smiling Buddha this week. The statue will be 38 meters (124.5 feet) tall and cost 200 million yuan (25.6 million $US). Maitreya (Big Smiling Buddha) is a very popular image of Buddha among Chinese people. The Chinese people altered it into the image of a local monk called Cloth Bag monk (Bu Dai monk). The Xuedou Temple was built in Jin Dynasty and relocated in 841 a.d. during the Tang Dynasty. 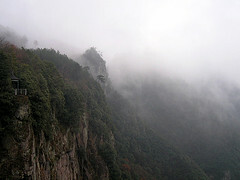 The temple was known as the "Buddha Temple near the Waterfalls. 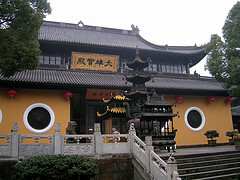 The temple is located on Xuedou Mountain and considered one of the 10 greatest temples. The temple was burnt almost completely down during the cultural revolution. It has been rebuilt and notably during 1953 and 1962 where refurbishment of the figures took place. Then again in 1986 where major temple rebuilding occured. The Xuedou Temple in Fenghua County will starting building the new Giant Smiling Buddha in early January 2007. The statue will be 38 meters (124.5 feet) tall and cost 200 million yuan (25.6 million $US). Maitreya (Smiling Buddha) is a very popular image of Buddha among Chinese people. After it was brought to China, Chinese people altered the image to one of a local monk called the Cloth Bag monk (Bu Dai monk). The Buddha has a wide smile, his belly and hissincerity. The Cloth Bag monk (religous name was Qici) lived between 907 and 923 A.D.He was born in Changting Village in Fenghua, he styled himself as a man in Changting Village. After he became a monk, he went from temple to temple in Fenghua. He became partial to the Xuedou Temple.